Armando Gómez is suddenly a subversive. And only an act of God, or George Bush, will allow him to attend the piano tuners convention in Dallas this week. Gómez laughed at first when U.S. authorities refused his travel visa. “What am I? A Taliban?” the Havana piano technician said. Then it sank in. He can never again travel to the United States unless the U.S. president intervenes. U.S. officials rejected his visa application under an obscure immigration rule giving Washington broad discretion to deny entry to foreigners, including those considered potential threats to national security or public safety. However strange the visa denial may seem, it is an everyday occurrence in the rarified world of U.S.–Cuba relations, experts say. America and Cuba have been at odds since 1959. They’ve fought with bullets and bombs in the past. But these days, they battle with words and speeches, visas and red tape. Caught in the middle are people such as Gómez, 49, the director of Havana’s School/Workshop of Tuning and Instrument Repair. 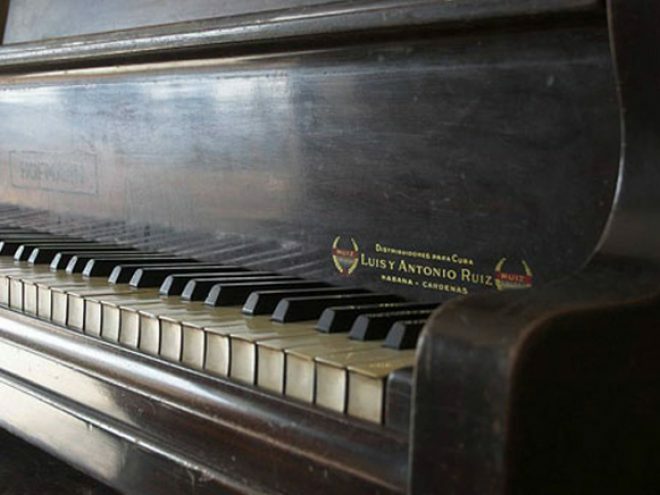 He began fixing old pianos in 1989. Many of the country’s musical instruments are falling apart. Spare parts are scarce. Bush administration officials have made it more difficult for Americans to travel to Cuba, and they’ve clamped down on Cubans, too. They’ve rejected visas for everyone from Ricardo Alarcón, President of Cuba’s National Assembly, to Chucho Valdés, an acclaimed Cuban musician who has won six Latin Grammies. U.S. officials stamped Gómez’s Cuban passport “212F.” That refers to subsection 212F in the Immigration and Nationality Act. It was added to the law as a presidential proclamation and allows the government to deny entry to foreigners for a variety of reasons. Subsection 212F was first used in July 1995 to detain a high–level official of the National Patriotic Front of Liberia, accused of atrocities in that country’s civil war, according to Human Rights Watch. American officials declined to offer a specific explanation for Gómez’s visa denial. But they said some Cubans didn’t obtain visas because they don’t apply in time. New homeland security requirements require in–depth screening of applicants and Gómez didn’t apply until April. American officials say any visitor from Cuba or any of the other six nations that the United States considers to be state sponsors of terrorism must go through a tough screening process. Without referring specifically to the Gómez case, the official said Washington rejected some Cubans’ visas in retaliation for actions by the Cuban government. Cuban authorities, for instance, do not allow Americans to carry out public diplomacy––to freely express their views to ordinary people in Cuba. So U.S. officials aren’t likely to let a Cuban diplomat or Cuban government employee do the same in the United States, the official said. He added that “people get denied visas all the time for all sorts of reasons.” And that is insignificant in the case of Cuba, he said, where the focus should be on such issues as the lack of basic freedoms and the jailing of political dissidents. In Dallas, piano tuners began setting up June 1 for the Piano Technicians Guild convention, which ran through July 6. About 700 guild members from countries as far as Germany, China and Japan were expected to attend. He laughs again at the thought that he’s some dangerous terrorist. But it also makes him sad. He’s attended piano tuning conventions in the United States in the past and he wants to return. Now though, he has 212F stamped on his passport and he doubts he’ll be back.